Lots of activity this month which saw the staging of an exhibition by the Heritage Centre to commemorate the 140th anniversary of the formation of R.A. Lister & Co. in 1867. 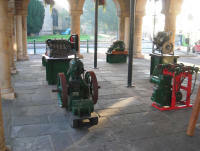 Lister-Petter brought along several engines, old and new, which were placed under the Market House and upstairs in the Town Hall and in the Heritage Centre itself there were numerous displays of artefacts, paperwork and photographs which attracted more than 200 people to the town. Many old acquaintances were renewed as ex-employees took the opportunity to catch up with developments and look back at times gone by. Elsewhere, the construction work continues apace along Uley Road and Union Street in addition to the larger developments of Crest Nicholson and Littlecombe. 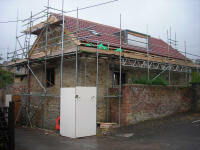 Uley Street also saw the opening of a new hairdressers' business in the vacant shop near the entrance to the Ferney and further clearance work took place behind the "Warehouse" in May Lane. In Water Street the old swimming pool has now been re roofed and is looking much more respectable after being derelict for over a year. As part of the 140th anniversary commemoration of the start of R.A. Lister & Co., Lister-Petter brought along several engines which took up pride of place under the Market House. 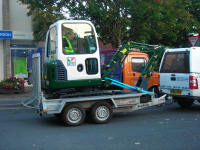 Leaving after the end of the exhibition is Lister's new mini-digger which spent the day in the town centre, attracting much attention. 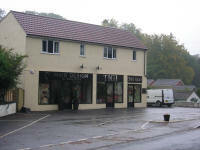 The empty building on Uley Road has at long last been occupied by a new hairdressing business. For many years this site was occupied by a petrol station and garage. Further along Uley Road, the long vacant plot, once earmarked for industrial use, is now seeing the construction of a new block of flats. In Union Street, close to the entrance of the old Boulton Lane school field, stands yet another new row of houses. 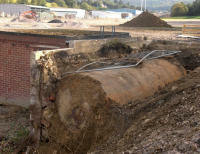 Near the location of Dursley's old gas works at the bottom of Kingshill Lane, this tank has recently been uncovered during construction work on the Littlecombe site. 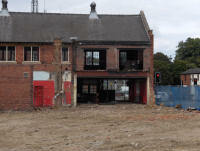 The land behind the old Coop in May Lane, more recently the warehouse, has been cleared and the old cellar filled in. In Water Street, refurbishment of the old building of Ayliffe's Crystal Tepid Swimming Baths is now showing good progress as the new roof goes on.